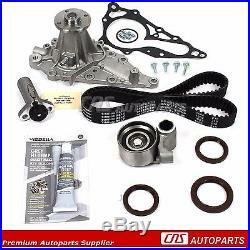 98-05 Lexus GS300 3.0L V6 2JZGE Timing Belt Hydraulic Tensioner Water Pump Kit. 98 - 05 LEXUS GS300/ IS300. 3.0L (2997cc) DOHC L6 24V, "2JZGE". TIMING BELT + RTV Silicone W/ SEALS HYDRAULIC TENSIONER KIT w/ WATER PUMP. 98 - 05 LEXUS GS300 3.0L L6 DOHC 24V 2JZGE. 01 - 05 LEXUS IS300 3.0L L6 DOHC 24V 2JZGE. 1 Timing Belt (143 teeth). 2 Camshaft Seals (40.5 X 52.5 X 6.5). 1 Crankshaft Seal (46 X 63 X 6.5). 1 Hydraulic Timing Belt Tensioner Adjuster. We firmly believe our parts are free from any defects in workmanship, material and that all manufacturing is processed under a strict quality control environment. Absolutely no exchanges will be made for any products that has been damaged, misused or improperly installed. We hope to continue to grow domestically and expand internationally. We will do everything we can in order to build your trust and business. The item "98-05 Lexus GS300 3.0L V6 2JZGE Timing Belt Hydraulic Tensioner Water Pump Kit" is in sale since Tuesday, August 30, 2016. This item is in the category "eBay Motors\Parts & Accessories\Car & Truck Parts\Engines & Components\Timing Components".